Who was Clogoittah? Was this the mother of Creat and Susannah Priber? According to Wikitree and many many other Internet genealogy websites, Christian Gottlieb Priber married a woman named Clogoittah, daugher of Moytoy of Tellico. She is said to be the mother of two of his childen; Creat and Susannah Caroline. Is there any truth to this? Is there any proof? By proof I mean something, a document of some sort, which tells us, hopefully with direct evidence that Clogoittah not only married Priber, but was the mother of his children. I'm going to cut to the chase here. I, as well as other excellent researchers have looked high and low for proof of the existence of Clogittah and her daughters and we cannot find anything. That's right nada, nothing, not a single shred of evidence. Not even a whiff of something. Now I'm talking about real bona fide evidence, not the crap found in Shawnee Heritage Books or other totally undocumented books or websites. I am speaking of legitimate sources. Okay, I know you're disappointed but before you start calling me names let me tell you who Clogoittah was. Oh, yes therdee really was a Clogoittah. A real documented person. There is even a drawing of Clogoittah. So why am I so sure that Clogoittah did not marry Christian Priber.......Clogoittah was a man. Engraving of the seven Chiefs, Clogogittah is in the middle. The Chiefs returned to their homes after a four month visit to England. No much is known about Clogoittah. 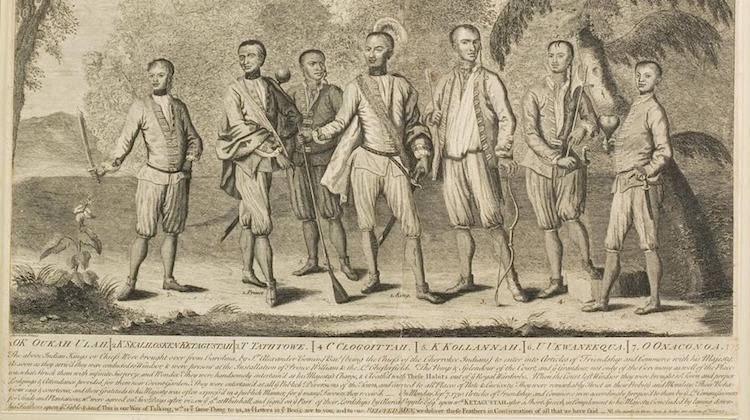 In 1756 Attakullakulla told the Governor of South Carolina, "I am the only Cherokee now alive that went to England...." So, Clogoittah must have died by that time. There is no record of a female named Clogoittah. If you can produce such a document, I would love to see it. Note: an unsourced book or an unsourced ancestry tree does not count. Alden T. Vaughan, Transatlantic Encounters, American Indians in Britain, 1500-1776, (New York: Cambridge Univeristy Press, 2008) 141.